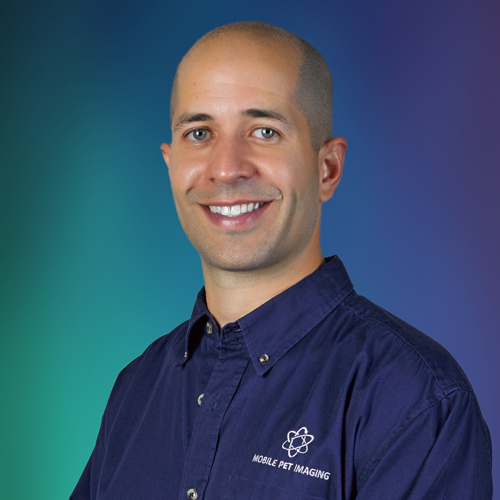 Meet Mobile Pet Imaging’s Lead Veterinarian. Dr. Xavier Meaux was born and raised in Puerto Rico. He received his Bachelor’s in Animal Science from Purdue University in 2002 and graduated from Tuskegee University School of Veterinary Medicine in 2006. Following graduation, he worked at Durango Animal hospital in Las Vegas, Nevada. After 5 busy years in small animal practice, Dr. Meaux moved to Florida where he worked as a relief emergency veterinarian in Tallahassee and South Florida for 3+ years. Dr. Meaux enjoys spending time with relatives, friends and his very active Jack Russell Terrier. Traveling, running, and grilling are among his free-time preferences. He attends yearly continuing education meetings, enjoys local veterinary industry gatherings and networking with colleagues.